Spring is in the air, finally! After a long winter, the first green on the trees feels well-deserved. Anyone who has pear, apple or magnolia trees in their yard will feel the abundance throughout the season. While all trees provide shade and beauty to a yard, these three in particular provide a lasting richness. After offering the beauty of their delicate pink and white blossoms, apples and pears bear fruit that can be used in a plethora ways—fresh eating, canning, juice or cider making, and baking. Magnolias, with their large and decadent flowers, are a luxurious, eye-catching addition to a yard. Not only that, they provide food for pollinators like bees. The first step of growing fruit and flowering trees at home is selecting the right kind of varieties for your area and growing needs. Both apples and pears come in a variety of sizes. Dwarf and semi-dwarf trees make it easiest for home growers to gather the fruit. Standard apple trees, for example, can reach 30 feet tall and will take 4 to 8 years to produce fruit, whereas dwarf and semi-dwarf will range from 6 to 20 feet and will produce their first harvest in fewer years. As of May 2018, Wolff’s carries Macoun apple and Bartlett pear semi-dwarf trees. The majestic magnolia can be an expansive tree. Southern Magnolia can grow to be 80 feet, with a 50 foot wingspan. This May 2018 at Wolff’s, you can find the Magnolia ‘Jane’ variety, a top choice for home growers. It reaches 10 to 15 feet high and spreads out 8 to 12 feet. “Jane blooms later in the spring and can typically avoid the damage late frost causes,” says Holly Thorpe of Wolff’s Plant Department. Does this tree need a pollinating pair? Most apples and almost all pears need to be cross pollinated with another apple or pear tree, respectively. When selecting your pollinator tree, make sure it is a variety that produces pollen. For example, the apple Jonagold does not produce any pollen. Magnolias can be planted as a single tree. What soil type does this tree require? Pears need deep soil, with a pH of 6.4 to 6.8. Apples can do well in a variety of soil, but thrive when fertilized on annual basis. An apple tree will struggle to produce high-quality fruit if there is a lack of boron, potassium and calcium in the soil. Most magnolias thrive in moist, acidic soil. While researching your trees, you may come across information about diease-resistance. Many apple trees do succumb to apple scab,Venturia inaequalis. However, apple scab is cosmetic and does not harm the fruit. Research has even shown that fruit with apple scab provides more antioxidant and anti-inflammatory flavonoids than their flawless counterparts. After you select your trees, you will want to plant them! Spring is a great time to plant fruiting and flowering trees in your yard. 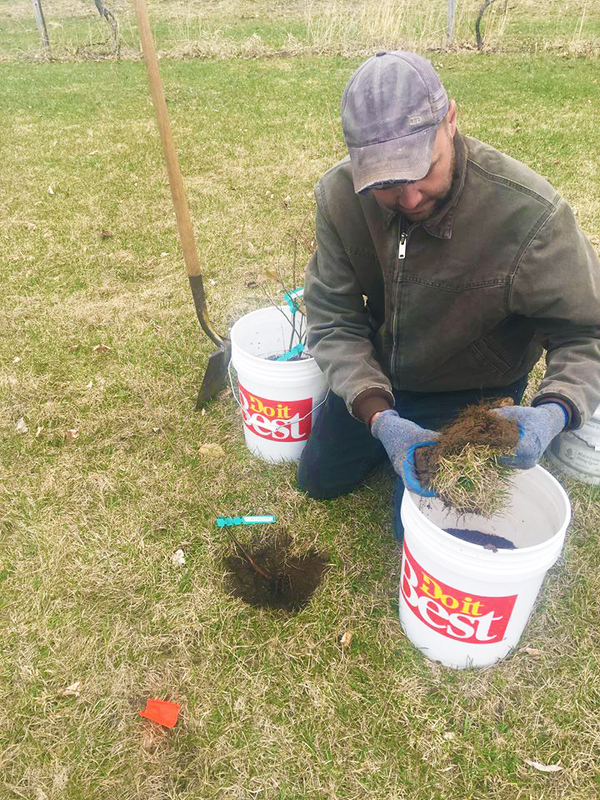 Planting in spring allows the trees to acclimatize to their new home and establish a healthy root system before the winter sets in again. In zones 7 and higher, it is also possible to plant in late fall, because the winters are not as severe. Apples and pears must be planted within 50 feet of their cross-pollinating pair, and do best in places with full sun. When planting the tree, make sure to dig a hole that is as big as the root system of the tree you are planting. Make sure that it will cover the root ball, but is not so deep that grafted trunk is covered. If the graft tree is buried, it may start to root. If it starts to root, it could take on the characteristics of the grafted apple tree, instead of the rootstock. It is the rootstock that has been selected for its growing traits, such as dwarfing, semi-dwarfing, cold-hardiness, and vigor. 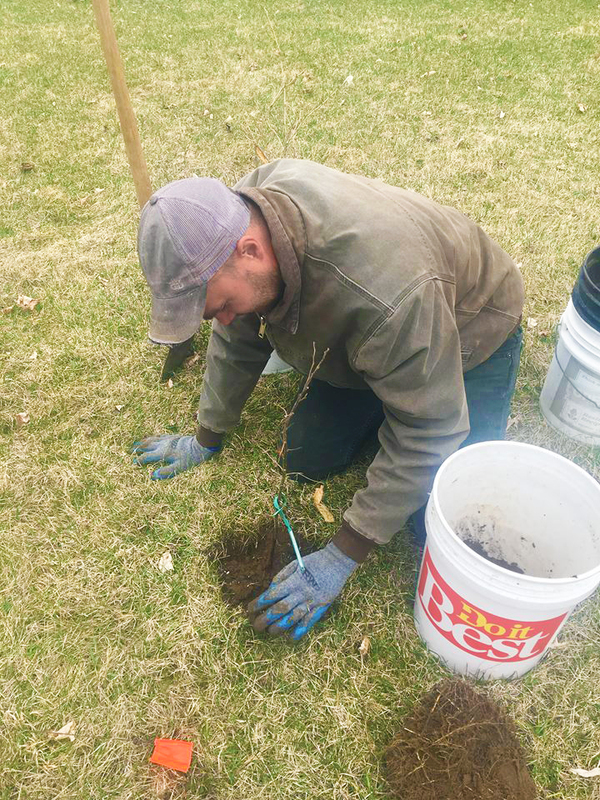 This tree planter looks for the graft mark before planting it. 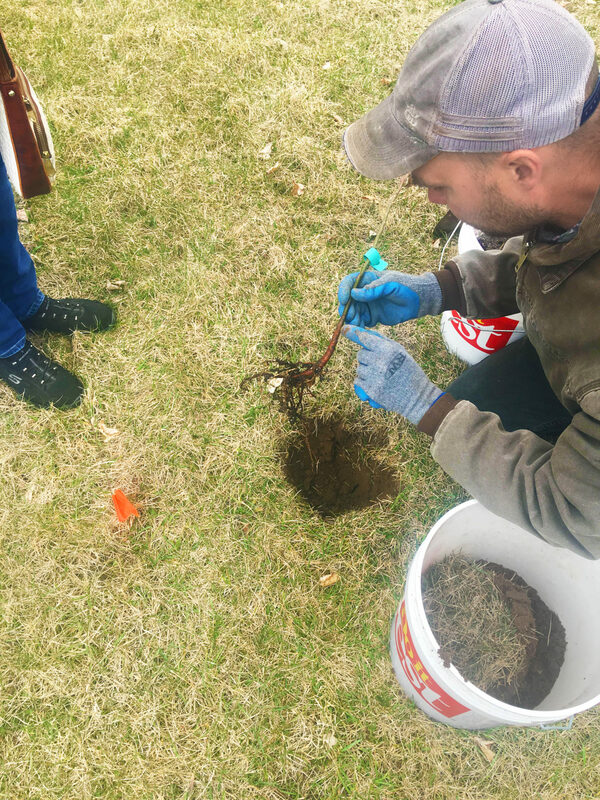 After digging the hole and placing your tree in it, you will want to refill the hole with the dirt you just unearthed, mixed in with compost, which breaks down over time releasing the nutrients slowly. Chemical fertilizer, on the other hand, gives a supercharge all at once and is not recommended for trees in their first year. Be sure to tamp down the dirt and avoid pockets of air in the root ball. Also, avoid creating a divet around the tree as water may pool around the trunk. After your trees have been planted, mulch around the base, but do not allow the mulch to build up directly around the trunk. You want to avoid pooling water and mulch touching the trunk of the tree because these elements could introduce fungus to the tree. However, the mulch, a few inches from the trunk, will create a weed barrier and provide nutrients to the tree as it breaks down. 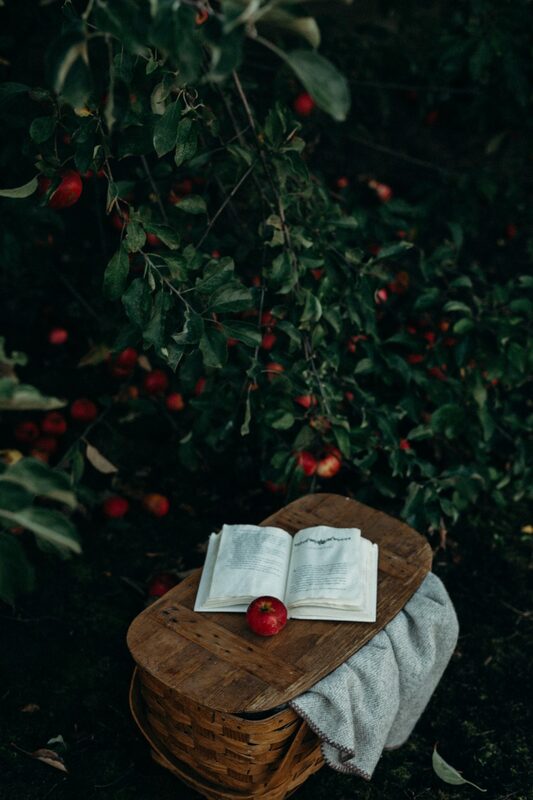 Guest blogger Alessandra Simmons is a writer and grower on Washington Island, WI, where she and her husband have a fruit and vegetable farm. She is also a cofounder of Gathering Ground, a nonprofit focusing on sustainable agricultural education.